Why uphold the atelier tradition? We know of the genesis of genius in the 4th century BC Ancient Greece, out of which three dimensional art was suddenly totally transformed from strict and stylized representations of the human form into more natural beauty. This universal truth and beauty did more than replicate real life. It had the power to transcend time, space and their corollary motion, and therefore Nature. This new art influenced the next fifty years which saw the building of the Parthenon Temple around 447 BC, whose artistic legacy 2,500 years on is unsurpassed. Ateliers help to push our boundaries. 1. An Historical Guide to the Sculptures of the Parthenon. On Mount Olympus lived and worked the master sculptor called Phideas, a civic superintendent of the arts in Athens. It was his pioneering atelier or sculpture workshop, the School of Phideas, which produced the famous Parthenon Frieze (displayed in the British Museum). Artists from far and wide lived under the master. They shared ideas, knowledge and subject matter and forged phenomenal artistic standards, which earned great honours for their unique co-creations. 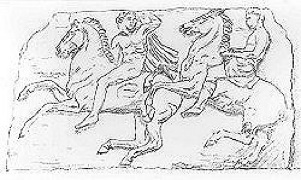 The ridden horses of the Parthenon Frieze are a triumph of realism and fidelity to equine anatomy and movement. It's steep angle of view and revolutionary bas relief of no more than 2 1/4" deep gives the illusion of three dimensional spectacular movement in the form of a glorious Panathenaic cavalcade. The aim was to dignify a festival every four years, to represent all the elements of Athenian civic life, and honour their patron and Goddess of Wisdom, Athena. It is designed to be viewed from a great distance below and situated 60' high was enclosed within the Parthenon colonnades, so received no direct light. Yet the Greeks imbued the panoply with sufficient reflected light off the surrounding elements to amplify the glorious harmony and technical brilliance of this new form of life-like animation. It was the ultimate Athenian Periclean civic pride. In the 15th century a great many works from the ancient world were being rediscovered. This led to the Classical and High Italian Renaissance, a culmination of highest endeavour in the humanities, sciences, and in the arts a quintessential mastery of every technique, artistic skill, and innovation – Raphael, Michelangelo, Leonardo da Vinci – mirroring the golden age of classical antiquity. During the Industrial Revolution of the 18th and 19th century, the expanding middle classes 'must' was to go on Grand Tours, leading to the close study of Greek and Roman antiquity, but often done (copied) to death. Copying from existing artworks and not from life led to poor standards of understanding, and a headlong rush to exhibit. The philosophy of the system of the French ateliers of the 19th century was also primarily life study, directly from nature – precepts of the classical art of antiquity. The ancient Greeks also gave us the Art of Equitation rarely illustrated in history until after the Renaissance, when the classical system of training horses took Europe by storm. To have real working knowledge of the actions of the horse means studying from life. Both the manège and the studio arts demand periods of heightened observation and concentration to become a truly erudite rider or artist. In time with patience and persistence we get to know the real horse under saddle or on canvas. Copying photographs greatly inspires - they freeze-frame the infinite beauty of the horse’s extraordinary motion. But total reliance means affects our really seeing, and have confidence of line control of a moving image. Imagination, even artistic life may be foreshortened if this way alone. Leonardo’s sketches reveal challenges he faced when drafting a three quarter view of an animated horse for large scale sculpture. With combined challenges of proportion, perspective and conformation the 21st Century artist can achieve help through progressive Essential Outlines as at the EquArts Atelier in South East Leicestershire, under founder tutor equestrian artist Sue Bird. is an independent educational and cultural initiative involving an unusual methodical approach. Arising out of an iconographic landscape arose a series of equine playful incidents in Nature, a published study of formative natural and extraordinary equine movement called AIRS APPARENT - see Gallery. It sparked Drawing Horses for Beginners, A System for Drawing Horses in the 21st Century (DH21)(Copyright). The syllabus addresses the horse's normal range of movement, the walk, trot and gallop. It also explores that rarified realm beyond - an illusive panoply of uninhibited attitudes of play called Airs, or Schools which our eyes need training to recognise. We study the classical horse in a classical setting* - attended by people from all walks of life, the artist/non artist, equestrian/non equestrian. Themed learning experience builds on observation skills alongside an exciting and unusual approach to the technical side of drawing static horses then way beyond the gallop! We never stop learning and through constructive play compete only with our evolutionary best and that means the tutor too! We offer weatherproof courses and classical drawing criteria for individuals or groups *mostly studio based, as described within Courses. The founder and tutor of the EAA Susan T Bird is an Associate Member of the Society of Equestrian Artists, two and three dimensional art work see www.equestrianartists.co.uk - Gallery. Also a founder member of the Classical Riding Club www.classicalriding.co.uk. I loved the construction and spatial aspects of the initial Level 1. I'm more accurate with proportion, have more knowledge, and more fluidity in horses' movement. I like the link up with classical. I know it will then be correct.